Do you work at Danny's? Terrace seating in front of the shop. What did you think of Danny's? Food was pretty good. Horrendous service. Money hungry guy taking in the money. Work nearby and a colleague also has the same issue. I hear ya Sheila. Trouble is you can't really complain about the food, tis good quality and an abundance of it. It's a real shame as I would go back if it wasn't for the 'MONEY' management. I went as i work locally and the salads looked fresh and rather delish. I got a takeaway box, but as it was a sunny day in London (which less face it are few and far between) I perched on one of Danny's outdoor seats. A couple of other Danny punters followed this initiative. Anyway wasn't long before the manager came squawking "Guy's just so you know, these seats are for EAT IN ONLY. It actually costs to sit here". fast forward 2 months I go back on another sunny day, order EAT IN as i was instructed on my last visit. The salad was great and so large I needed a takeaway box as i wanted to save the rest. Then the same manager had the nerve to huff and puff and say i needed to pay extra for the box as it costs more to take away.... What the? Lack of consistency and customer skills I say. Had a great lunch at Danny's & what a great concept & unusual to find such great tasting food with such an emphasis on healthy eating. Their wraps are to die for, I had the mogul wrap with loads of chicken tikka & salad topped with a delicious mint & yogurt dressing. My friend went for one of their design your own salad boxes. We both had smoothies which were made freshly for us & were so packed with fruit, I added Protein to mine perfect for after our workout. Cant wait to go back & try some more! Possibly one of the best value-for-money lunchtime spots in Holborn, this independent eatery has thought of everything. 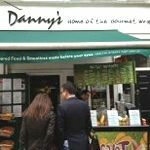 Danny's Gourmet Wraps benefits from its position on Lamb’s Conduit Street – a quiet little side street with a large amount of pavement space that allows them to offer a few popular outdoor tables when the weather is nice. The venue itself is cutesy, with a large green canopy overhanging the pavement and an outdoor smoothie counter where they blend your chosen drink in front of you. Inside is tiny, with a large serving counter taking up most of the space on the right-hand side. However, there are a few high stools and a couple of small dining tables and chairs if you really want to sit in. Just remember that this place gets very busy and it won’t be the most laid back dining experience if you choose to sit in during peak lunchtime hours. Danny’s Gourmet Wraps can be chaotic at lunchtimes and it’s not unusual for the queue to trail out of the door and down the street as office workers from the local area head here in their droves. Still, the staff do an extraordinary job of keeping the queue moving and you’ll never be left waiting for too long, even if it is really busy. The outdoor smoothie area is a great idea during the summer but the only problem is you have to queue and order it inside, whereupon you’re given a smoothie token that you go outside and redeem. It’s a rather convoluted system that puts some passersby off when they see the queue. This is where Danny's Gourmet Wraps really earns its stripes. This is a place that has thought of everything and they offer a huge choice of food for anyone with any sort of dietary requirement, from coeliacs to anyone with a wheat or dairy intolerance. And there's a lot on offer for dieters, too, with sweet potato versions of the jacket spud being just one example of what they’ve thought of. Of course, the wraps rule supreme here and justifiably so - they're really good. For a start, they are massive (the size of a human head) and well priced at £5 and under. And you can go with one of their many gourmet choices or build your own – it’s very flexible and left open to you, the customer, to make your lunch what you want. A great example of what they can do is The Holborn, which is a huge wrap, cut in half, literally packed to bursting with a creamy free range egg mayo, spring onions, an almost too tart green pesto, sun-dried tomatoes and a mixed leaf salad, all for £4.50. Just be warned, this is a huge sandwich and you may struggle to finish it. If you have a work mate who’s willing to share then it may be the route to go. As well as the smoothies, they offer a choice of Illey coffee here, all priced at £2 or less. However, the smoothies steal the show. They have a choice of every type of smoothie you can imagine, all made from fresh fruit and with a selection of immune or energy boosting options. You can also choose to build your own, with or without yoghurt. The raspberry, orange, strawberry, banana smoothie with yoghurt (£3.50) is so big, so packed full of fruit and so filling, that it can serve as a lunch all by itself. If you happen to make a rookie mistake and mix it with a gigantic wrap, you’ll barely make a mark in your lunch before being defeated. Danny's Gourmet Wraps is an excellent all-rounder that shows exactly how an independent cafe can beat off the big coffee and lunchtime chains.